Thanks omy.sg for inviting me to the McDonald’s – The Spicy Faceoff event. The poster looks like the one The Hunger Game… scary, do I need to kill to eat? Didn’t have a proper lunch earlier on so I was starving when I reached but we cannot get into the hunger game till the manager finished briefing! I was super delighted when I see the shaker fries, yah… so far I almost like all the shaker fries flavours and that’s the only time when I will forget my diet and upsize my meal just for the friesssssssss~ The new shaker flavour – Citrus Thai taste like Tom Yum and they are YUMMY~ Can’t stop eating them like a fries addict. Worth to give it a try! Personally like the black pepper. Don’t think it is spicy actually though… the cornmeal dusted buns are really soft, just that I got a bit messy as the cornmeal keep snowing on my bag instead of inside my mouth. Mr McSpicy seems very confident that he will win.. even way before we started voting. Which burger did I vote for? As I mentioned, I am not someone who can take spicy food well. Looks yummy. 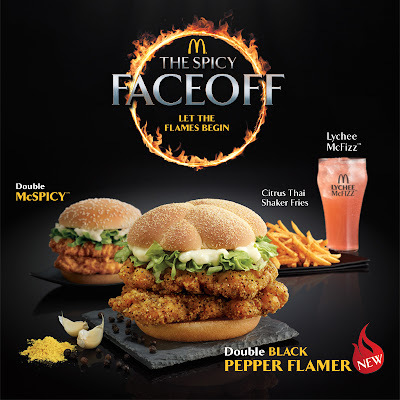 I would like to try the Black Pepper Flamer. The bread look soft and fluffy.